Colorful light bulb shaped OREO Cookie Balls are dipped in colored candy coating and sprinkled with shimmering sugar. Stir together the OREO Cookie crumbs with the cream cheese until well blended. Cover with plastic wrap and refrigerate for about 30 minutes until firm. Scoop out 36 tablespoon size portions of the dough. Roll each into a ball then shape into a Christmas light bulb. Remove a few bulbs at a time and insert a toothpick into the fat end of the bulb. Dip one bulb at a time into a colored confectionery coating leaving a small opening near the toothpick then lift out of the coating and allow the excess to drip off. Immediately and quickly sprinkle the same colored sugar over the candy coating. Set the OREO Cookie Ball Christmas Light onto a parchment paper lined baking sheet and allow to dry at room temperature for at least 20 minutes. Once the cookie dough has oozed out from around the toothpick, remove the excess leaving a flat opening. Cut the fudge rolls in half then use the knife to create grooves that look like the screw base of the light bulb. Attach a fudge roll screw base to each light bulb using melted confectionery coating. Let the candy coating harden for about 10 minutes. Brush edible silver luster dust over the fudge roll if desired. Your OREO Cookie Ball Christmas Lights are ready to serve. 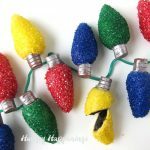 Wrap the OREO Cookie Ball Christmas Lights well with plastic wrap or wax paper (preferably individually) and place in a cardboard box. To thaw, remove from the refrigerator but do not open the box. Let the box sit at room temperature for at least an hour before opening and removing the cookie balls. The cardboard will wick up any moisture from the refrigerator keeping the candy coating on the cookie balls dry. If you freeze these, thaw in the refrigerator for a full day before allowing them to come to room temperature.